It’s pretty rare to host a national championship of any kind, let alone one that will attract participants from across the United States and abroad. The Dublin Convention and Visitors Bureau and the City of Dublin worked collaboratively for more than a year in an effort to land the United States Australian Rules Football National Championship right here in Dublin. We found out this week that Dublin was not only selected to host the 2013 National Championship but also the 2012 49th Parallel Cup, which is an annual event that features the United States National Team vs. the Canadian National Team. The event includes competition from both men and women. If you haven’t seen this sport, it is worth taking a look! Both events will be open to the public. These events translate into big business for Dublin – an estimated $2 million in economic impact will be spent by visitors and participants to these two events. 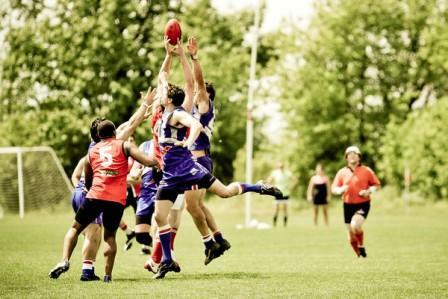 The 2013 U.S. Australian Rules Football National Championship will be held in the fall at Darree Fields in Dublin and will attract teams from across North America and abroad. The annual championships include a variety of divisions for men and women and attract clubs representing more than 40 cities across the United States. As you can imagine, securing these national championships was extremely competitive. Dublin competed against numerous cities across the United States and Canada. In the end, the tournament selected Dublin because of “tremendous facilities, passion and past history of hosting world-class events.” I’m not sure there are too many cities across the world with a population of only 42,000 that are hosts to so many international events – Memorial Tournament, Dublin Irish Festival, Ryder Cup, Presidents Cup, Can-Am Police Fire Games and now the U.S. Australian Rules Football National Championship – just to name a few!